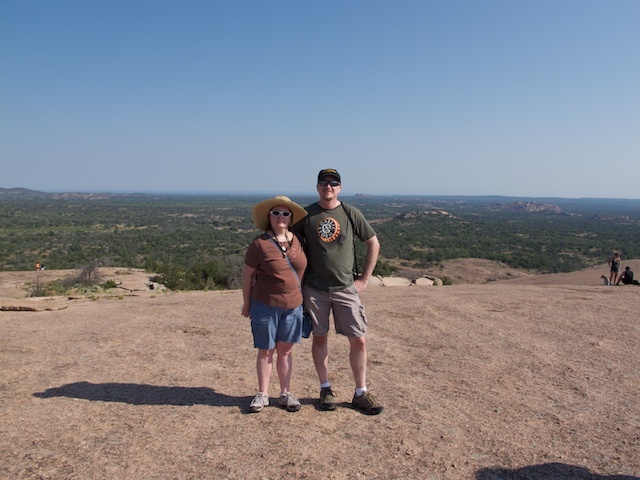 We got up early this morning and got ready for our trip out to Enchanted Rock. Breakfast arrived on time and was delicious! I didn’t feel in the least bit guilty about the extra calories because we were planning on taking the ranger lead tour. The drive out to the park was nice, we got some really good views of the hill country. We were actually a couple minutes late, but the ranger at the gate radioed over to the ranger leading the tour and had them wait for us. The hike was a lot of fun. We made it to the top, and then went down the side and hiked around the back before returning to the parking lot and heading back into town. The view from the summit was pretty amazing, and to see the ghost shrimp in the small pools on the rock was cool. On the way around the back, our guide pointed out different features and discussed the local plants. I tried one of the wild persimmons, which was delicious and quite unlike the ones in the stores. By about half way around the rock, the heat had started to build, and by the time we got back to the car, we were ready for the air conditioning. We headed back in to town and grabbed a quick lunch and rehydrated before heading over to Pedernales Brewing Company for another tour. They’re a much smaller operation than Real Ale, but they make some tasty brews and have a nice little operation. From there, we went over to Opa’s to pick up some brats and other meats. We’ve tried to stop there on other trips, but they close early and we were never there early enough. We made it this time and were rewarded with some yummy sausages, smoked cheeses, and seasonings. It’s a good thing we brought a cooler! Loaded up with carnivore yummies, we went back to the room to get ready for dinner. Since this is our anniversary trip, we decided to splurge for a nice dinner and chose the Navajo Grill. It was definitely a dressed up place, not just your average restaurant. What was nice was that the food and service exceeded our expectations. Delicious appetizers, perfectly cooked steaks, and wonderful desserts made for a great end to a really nice day.